User experience is something that you don’t normally hear about until something goes wrong. But what is it really and why does it matter? For starters, user experience, UX for short, is how a person feels when interacting with a digital product. UX has many factors, including usability, accessibility, performance, design/look, utility, ergonomics, overall human interaction, and marketing. But while they might sound similar, UX is not the same as usability. UX is the experience and the connection a user feels when on a site. Usability is more along the lines of how effective the site and scope of design is. So why should you care about user experience? Well, you take the time to pick the perfect fonts, colors, graphics, and content to ensure your site is visually stimulating but if people don’t know how to interact it, what’s the point? And more importantly, users need to enjoy the interaction they have with your site. UX is essential for complex sites because users need to be able to not only navigate through it, but also understand how to use it. Without UX, you might end up with a sloppy site that people would rather not visit again. Creating an easy and effective experience will drive users back to your site. One of the most difficult types of sites are that of retail or online sales. With so many products, the site has to be well organized, extremely clear, and easy to use in order for a customer to even want to make a purchase. Consider Amazon.com, it has worked using the same basic UX for years. Think because you’re a small business or start up that this doesn’t apply? Think again, your website is the first impression a customer gets so the debut matters in ensuring future traffic. The same is true for companies with small budgets. Investing in user experience can create a momentum that pushes a business forward. Remember, users decide in just a few seconds whether your site is worth their time. VoiceFoundry can help ensure a positive user experience, contact us today. Architecture of Amazon Connect from 1 to 10,000 agents…It Grows With You! Get subscriber only insights and news delivered by VoiceFoundry. 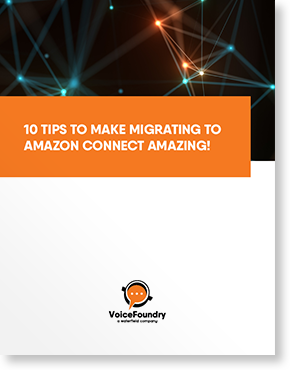 10 TIPS TO MAKE MIGRATING TO AMAZON CONNECT AMAZING! If you are considering making the leap to Amazon Connect for your Contact Center we have a treat for you! We have identified 10 critical items that you must consider before migrating to AWS Connect! And so much more! Don’t miss the opportunity to review our top 10 checklist items and rock your move.